While we’ll give most weight to performance in the week just gone, an out-of-the-blue, game isn’t going to sway us too much. We are looking for some degree of confidence this wasn’t just a one-off thing, whether it be played in other games this year, in college, etc. Since being drafted in 2016 (fourth round out of Stanford), Martinez has been on the field a lot. He played 480 snaps in his rookie year followed by 978 (93 percent of Green Bay’s defensive snaps) in 2017. Unfortunately, despite some good play against the run (89.6 run-defense grade last year), his play in coverage has left a lot to be desired. 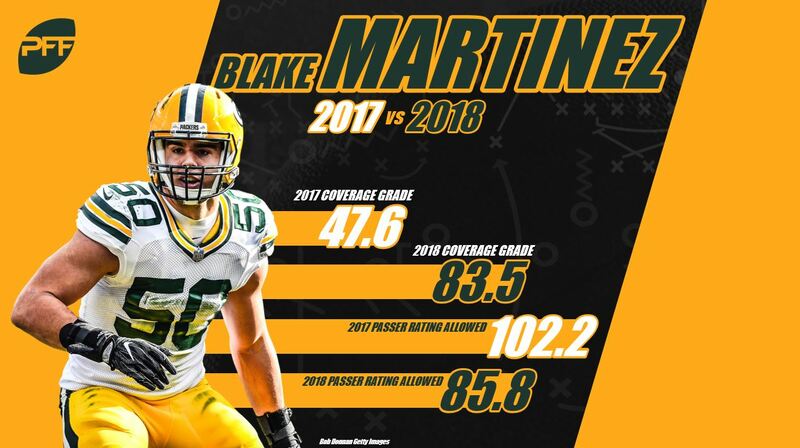 He’s made plays – he had an interception and five other pass breakups in 2017 – but that didn’t offset the fact he gave up three touchdowns a year ago and more yardage than any other Packer defender. Of his 14 missed tackles, 10 came in coverage and his 408 yards after catch allowed were second-worst in the NFL (after Kiko Alonso). So, it was fairly obvious what we needed to see coming into this season, improved work dropping back. And so far, that’s what we’ve seen. On 119 coverage snaps, he’s made six stops including forcing three incompletions and has given up no receptions against the Redskins. His play against the run hasn’t been quite as prolific but it’s been good enough and in today’s pass-happy NFL, that’s a price anyone should be prepared to pay. It’s always a little concerning when a player pulls out his best work in a contract year. Will they kick on or regress after getting paid? The Dolphins gambled $8M per year (making Wilson the joint 26th-highest paid receiver in the NFL) on the former and, so far at least, he’s repaying that investment. Up until 2017, Wilson had generated a generic replacement-level grade of 61.7 but significantly improved production last year, and prompted Miami to get out their checkbook for a three-year deal. 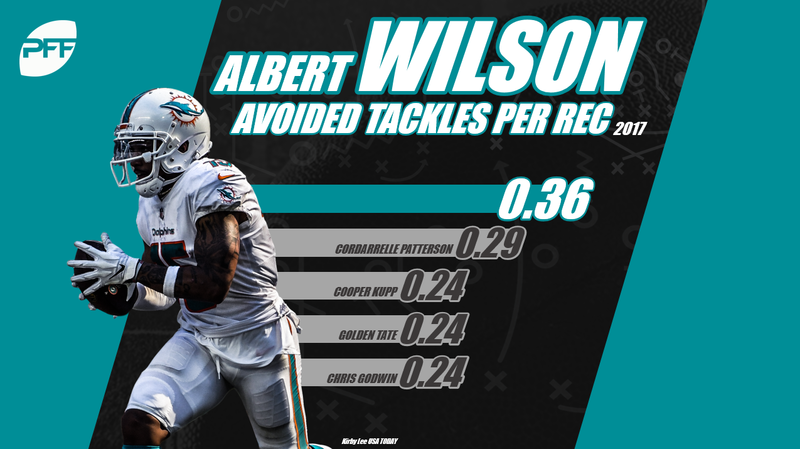 Most appealing was his ability after the catch with his 7.3 YAC/reception ranking second in the NFL last year largely predicated on his tackle-breaking skills. In 2017, only two players broke more tackles than the 15 he did on his 44 receptions: Golden Tate (24 on 94 receptions) and Jarvis Landry (16 on 117 receptions). This year, his production in limited snaps (73) is screaming out for more playing time. He’s second in the NFL in yards per route run with a remarkable 3.84 and feels like he’s primed for a lot more if the Dolphins can find a way to get him extra snaps. 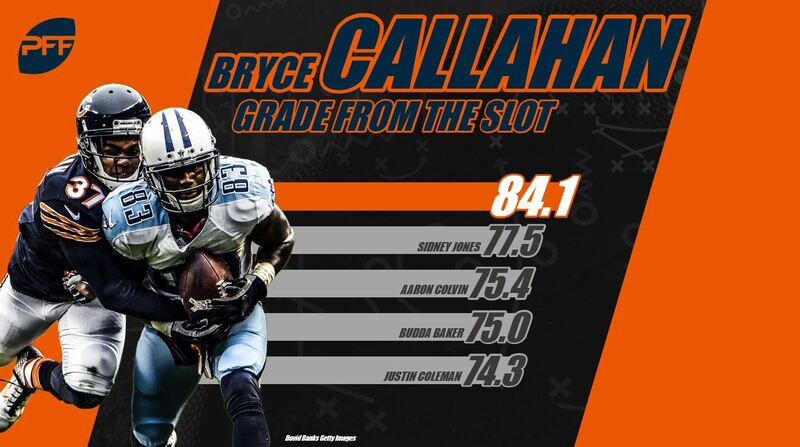 “While Callahan missed some time in 2017 with an injury, he performed well when healthy, generating the third-most slot coverage snaps per reception allowed. While he hasn’t offered much in terms of run defense or as a blitzer (only four career pressures), he’s allowed less than an 80.0 passer rating from the slot in each of his three pro seasons, showing a consistency that is a very valuable piece on an up-and-coming Chicago defense”. Well, this year he’s improved on even that, allowing only seven receptions on 112 coverage snaps for 50 yards and an interception. That’s a passer rating against of only 50.2 which is third in the NFL. He also owns the top grade of any cornerback while playing in the slot so far this year with 83.7. At the moment, it’s very hard to make much of an argument that the Rams offensive line isn’t the best in football. What might be even trickier is guessing which of them is the highest graded. 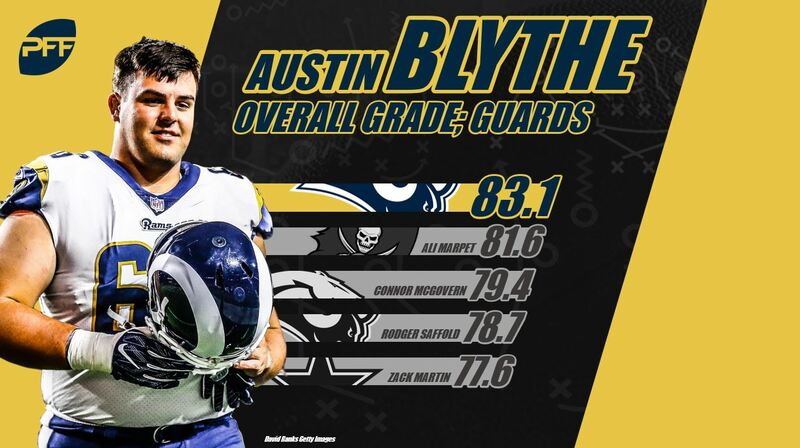 Ranking every offensive lineman across the league by grade, Blythe is second (with an 83.2 grade), Andrew Whitworth (LT) is fourth, Rob Havenstein (RT) is ninth while Roger Saffold (LG) is 12th. What’s even more remarkable is the fact Blythe was only starting because Jamon Brown was suspended for the first two games of the year but if Sunday against the Chargers is any indication, the third-year player has little intention of giving his job back without a fight. Through three games Blythe has only allowed one hit and one hurry, not been called for a penalty and blocked well for the run. His sternest test is coming on Thursday night against a Vikings defense no doubt stung by their lackluster performance against the Bills. If he comes through this one unscathed then maybe he’s a secret no longer. Cincinnati made little secret of their desire to upgrade at safety in the offseason and most particularly the need for a player at the back of their defense who had the range to play deep. It’s not so much that George Iloka and Shawn Williams played poorly (they both graded a little above average) but more the fact they had two guys who were effectively the same player, more at home in the box than playing single-high. The Bengals still wanted to be able to mix their coverages but when they went with one guy deep, they needed him to be a player they felt could consistently hold up in that role. So far things have worked out perfectly with Williams playing 70 percent of his snaps in the box (up from 48 percent last year) and Bates playing either in the slot or deep on 90 percent of snaps. But it’s the way he has played his role which is even more impressive. 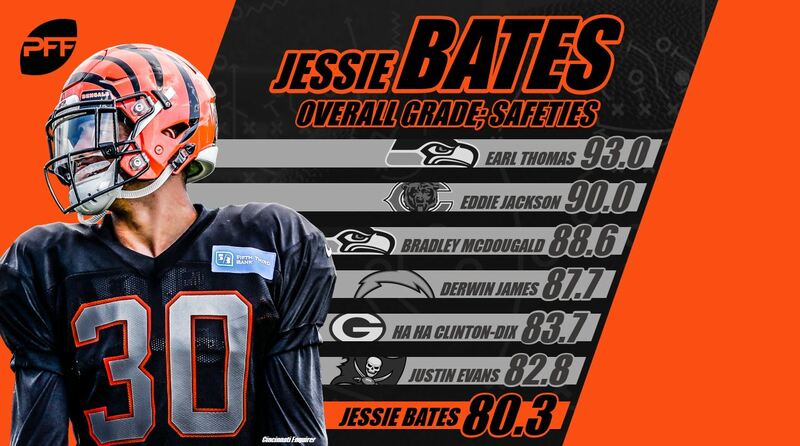 Currently, he’s our seventh-ranked safety playing well across all facets of the game and providing solidity on the backend the Bengals haven’t enjoyed since Reggie Nelson was at his best.